Dr. Kevin Moore cannot remember a time when he wanted to do something other than practice medicine. He admired his own family doctor growing up in Elizabethtown, seeing him as the embodiment of what a physician should be. He grew up watching M*A*S*H, even though the show was not an accurate portrayal of medicine in the military — something reinforced by firsthand experience. 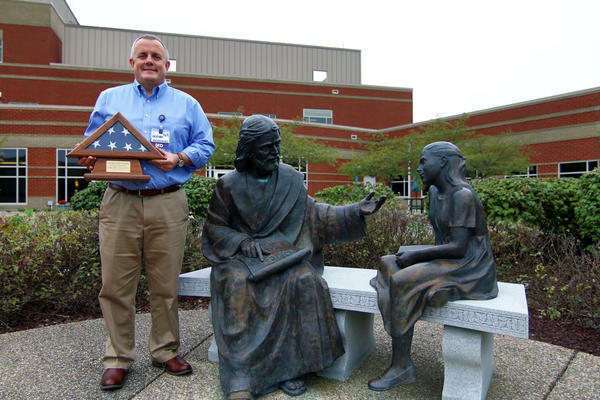 Moore, 48, has a lifetime of experiences that do not all fit on his resume, but he brings much of them to Bardstown in his first year as a retired military doctor transitioning into the world of civilian medicine with KentuckyOne Health. Dr. Kevin Moore catches up with Pat Riley at his office on Chamber Blvd. After his military retirement, Moore brought his medical training to Bardstown. Dr. Kevin Moore, a veteran, stands outside Flaget Memorial Hospital. After his military retirement, Moore brought his medical training to Bardstown. Having the dream of becoming a doctor from an early age, Moore took an opportunity to study at Murray State University when he turned 18. “They offered me a full scholarship,” he said, and he studied pre-med. He graduated from the school in 1991 with a Bachelor of Science in biology, and his plan was to continue on to medical school. However, Moore came from a working class family. His father worked in a chemical factory and his mom worked as a bookkeeper, so the idea of paying thousands for medical school seemed unattainable. To help his dream along, Moore joined the Army, attending medical school with the commitment to serve his country upon graduation. He earned a medical degree in 1995 from the F. Edward Hebert School of Medicine, part of the Uniformed Services University of the Health Sciences. After his graduation, Moore was committed to serve seven years with the military, but he chose to serve beyond that, kicking off a 22-year military career. “I liked what I was doing,” he said. His seven-year mark was around the time of the attacks of 9/11, and it did not feel like the right time to leave, he said. “Next thing you know, seven became 10, and 10 became 12, and 12 became 15,” and so on he said. In his career, Moore served in a variety of positions across the country, with his favorite being as director of residency training in Fort Belvoir, Va. Moore also served overseas, and from April 2012 to August 2013 was the senior medical officer for a multinational peacekeeping mission in the Sinai Peninsula in Egypt. There, he was responsible for medical care of thousands of service members and hundreds of civilian support staff. He coordinated medical care at two camps and 31 remote sites, including evacuations and mass casualty response. Most recently, he served as chief of the Department of Family and Community Medicine at the Brooke Army Medical Center in San Antonio, Texas, a position he entered into in 2013. While he gained something from each experience, Moore said his most rewarding work came from his 2003 deployment as a battalion surgeon in Iraq. He deployed with a mechanized infantry battalion, one of the first units to initiate the ground war into Iraq, he said. It was that experience that really taught Moore about serving his country. “The relationships you make with your fellow soldiers are just absolutely amazing, and when you’re living and working in the back of 577 armored ambulance right where the war fighting is taking place, you really get to know those two or three soldiers that you live and work with and everything really well,” he said. “Everybody is your fellow soldier and you love them for who they are,” he said. Something that has stuck with him from that deployment is the children and the families directly impacted by the war, and understanding not everyone on one side of a fence is an adversary. It was also hard to lose the soldiers in his unit, and those in other units he had cared for, as well as those lost to suicide or destructive behaviors after returning home. “You have a lot of young people in the Army, and it’s hard to see them get hurt,” he said. His military service exposed him to the tremendous personal sacrifice, perseverance and dedication of service members, he said, and to be their doctor was and is rewarding. When Moore decided to retire from the military, it was because he felt he had reached that point in his life to move forward and explore the medical work he had originally set out to do years ago. As Moore and his wife were looking for the next place to call home upon his retirement this summer, they settled on Bardstown. “We wanted to move back to a community that still had its downtown area, still had a sense of purpose, a sense of feeling and a sense of history,” he said. He also wanted to be close to his family members, many of whom reside in Kentucky. 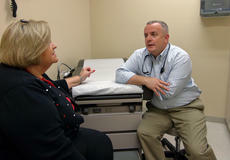 With a job opportunity with KentuckyOne Health Primary Care Associates, Bardstown fulfilled his checklist. With KentuckyOne Health, Moore works as a primary care provider and family physician, operating mostly out of an office on Chambers Boulevard. He treats patients from ages 13 and up. “We work with our subspecialists to manage diseases appropriately, and we serve as a champion for primary care health and wellness,” he said. His road to becoming a doctor was one with delayed gratifications, he said. His ambitions meant hitting the books while others went out for a night on the town, and his focus shifted from medical school, to residency and to whatever the next step might be. Asked about the transition from military to civilian work, Moore said working in a military hospital is not unlike working in a civilian one. “Our patients are just a little bit different,” he said, though his military work at different medical centers brought with it unique opportunities. As a family physician in the Army, Moore not only served his fellow soldiers in war zones, but at home. He delivered hundreds of babies, worked inpatient medicine, had the privilege of being a family doctor for a Congressional Medal of Honor recipient, and a physician for a World War II veteran who’d spent three days floating on a raft, thought to be lost at sea, among many others. Moore has his own recognitions to show for his career as well, with a Bronze Star Medal and an Order of the Military Medical Merit just a few on the list. One might not necessarily know about his military accomplishments, however, without asking or knowing him personally. For Moore, his service was just that — service. While his medals and recognitions might be tucked away in a closet inside his Bardstown home or elsewhere, it’s all part of Moore’s desire to move forward as a person and as a doctor. Retired Col. Kevin Moore, M.D., resides in downtown Bardstown with his wife, Jennifer, who is a teacher at Cox’s Creek Elementary School. He has a son, Alex and daughter, Katie, who live in the Washington, D.C. area, and a stepson Trevor, who resides in San Antonio, Texas. Moore comes to Bardstown from Texas, where he served as chief of the Department of Family and Community Medicine for the Brooke Army Medical Center. There, he was responsible for tactical and strategic operations at the Department of Defense’s largest military treatment facility.